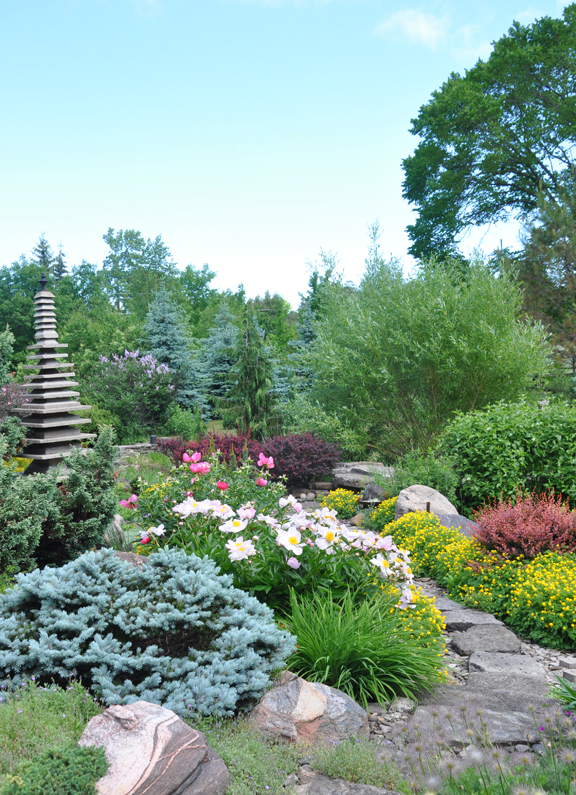 The steep, rocky slope and the splendid view of the pine forest beyond were one of the many things that first attracted John and Peggy Lewzey to their property near Everton, Ontario. 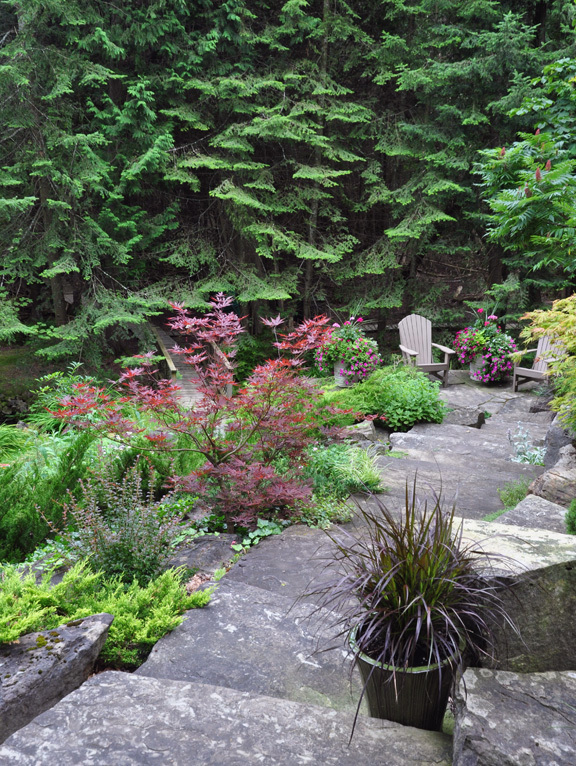 "Our previous house had a very open yard, so the privacy of the enclosed wooded garden was very appealing. The property was covered in snow when we saw it, but the bones of the house and garden spoke to us. 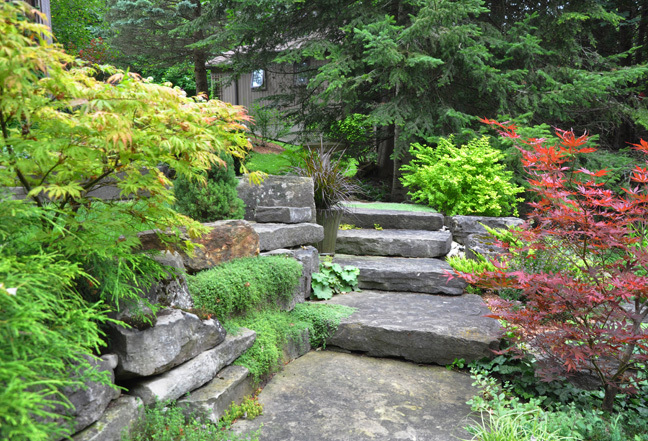 We thought that the existing concrete steps would, at some point, be replaced with natural stone," Peggy tells me. 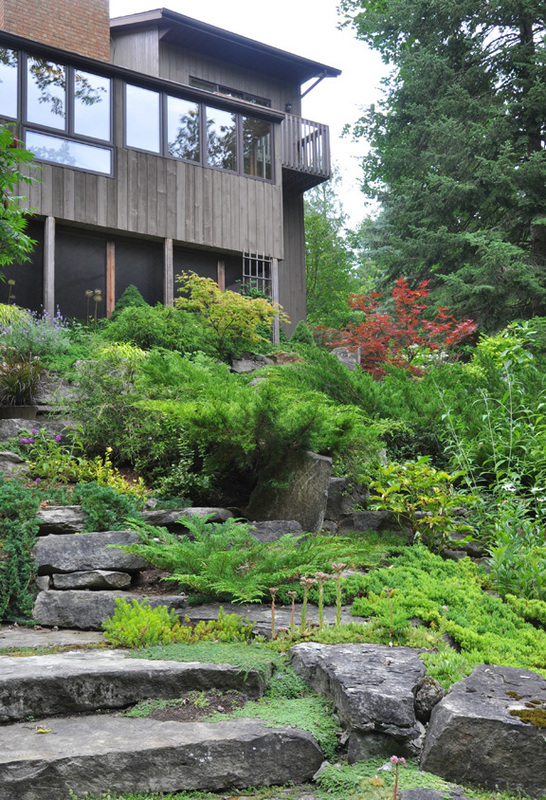 A stone staircase at the side of the house takes you down to a narrow plateau where you get the first glimpse of the waterfall and oval pond at the bottom of the ravine. 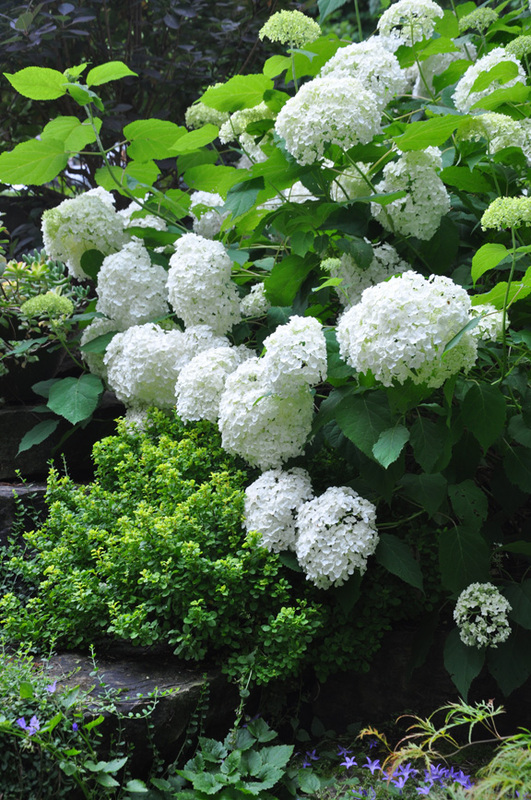 The lovely Annabelle hydrangea on one side of the stone staircase. 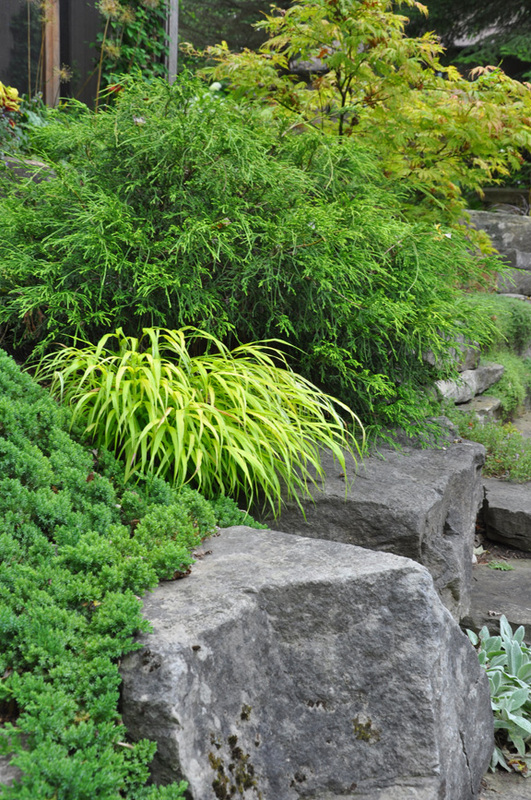 The striking contrast of bright green on grey stone. Looking back to the first set of steps. 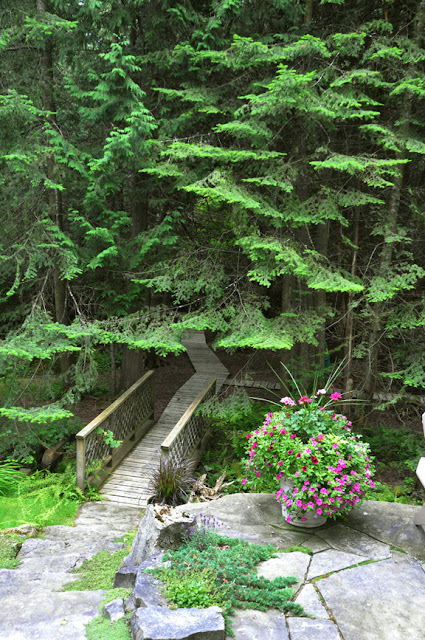 Looking forward to the steps down to pond. 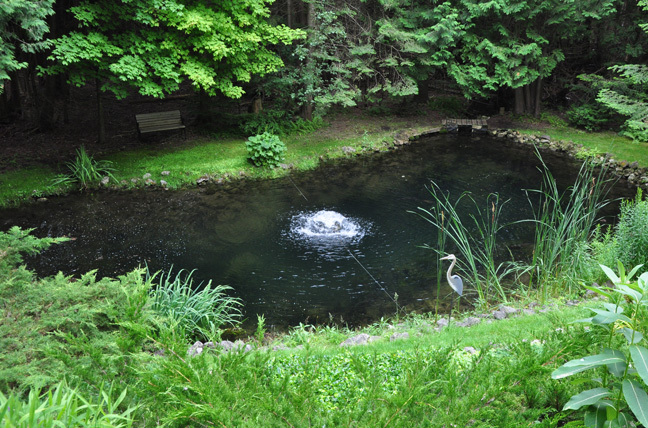 The first view of the pond. 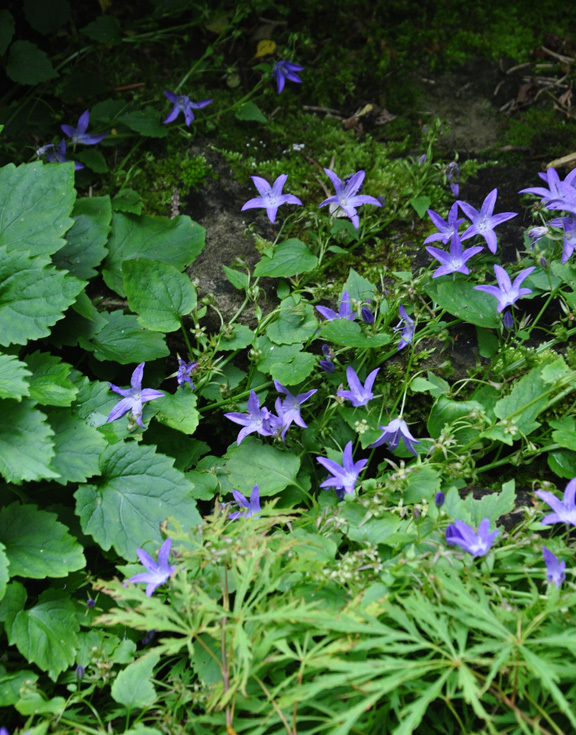 Bright purple Campanula set against the grey limestone. Imagine the effort involved in moving these huge boulders into place. They must weigh a ton! 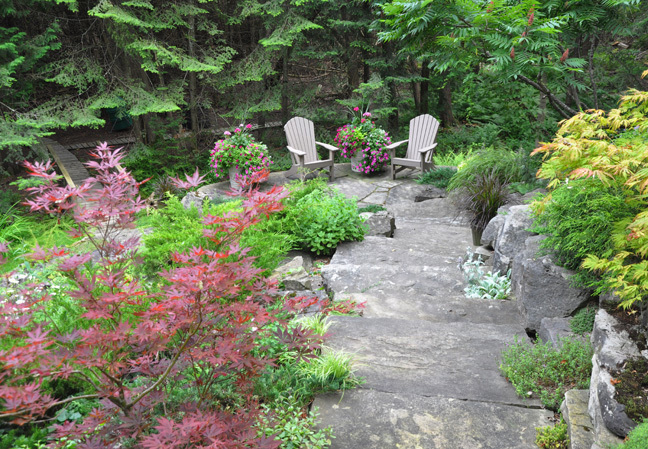 "The stone steps, paths and patio were added in 2010," says Peggy," We have a friend whom we consider an artist with stone. The dolomitized limestone was sourced by him from a quarry near Glen Williams. The stone suits the craggy landscape around Everton and Rockwood very well. The project took 2 months to complete and was accomplished by one man with a small bobcat machine." 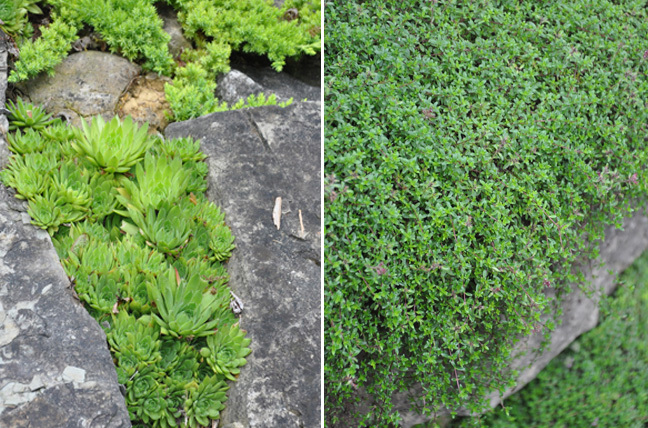 Left: Hardy succulents Right: A carpet of Creeping Thyme cascades over the rocks. 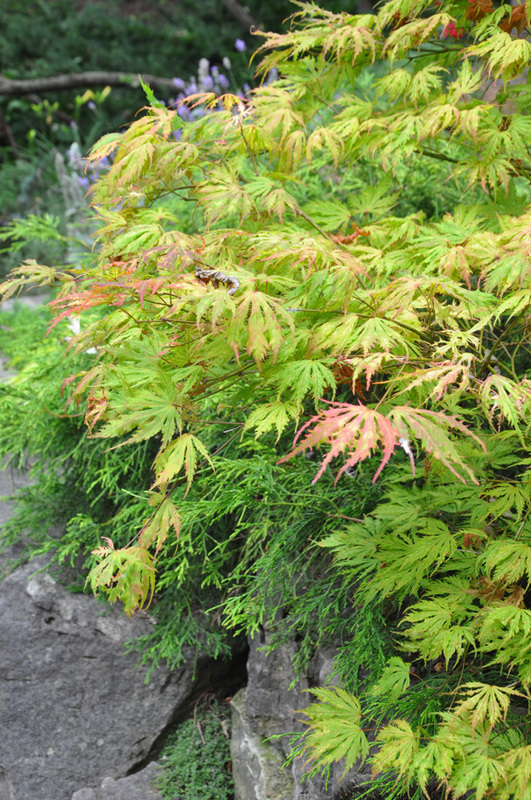 "Japanese Maples are a favourite shrub/small tree in our garden, especially those with fiery fall foliage", says Peggy. “Rob the Rock” was a delight to work with," says Peggy, "He would muse thoughtfully and decide which particular rock would be just the right one for a certain location. We had a rough idea of how things would look when they were finished, but it was very much a work in progress that would be adapted by Rob or ourselves as we went along. 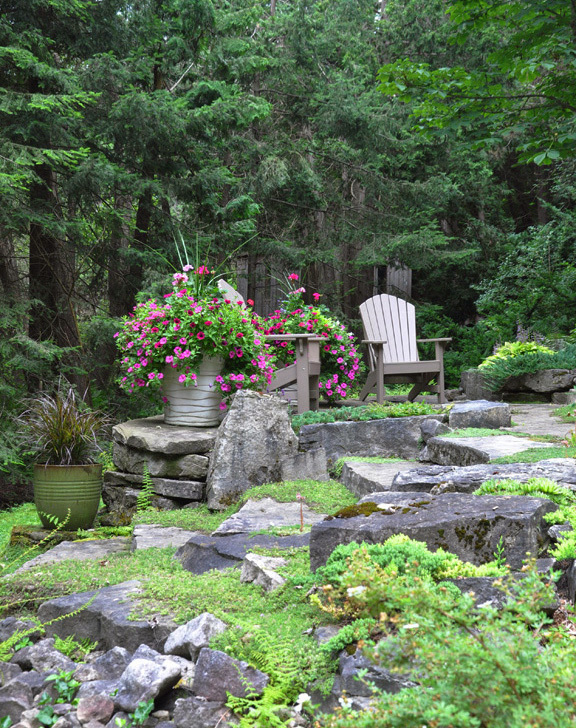 The flagstone was laid down by the bridge, working up past the dry stone wall that supports the patio, many meandering steps, a connecting pathway to more steps and the side garden. Then some stepping stones finally takes you to the driveway at the front of the house...37 steps in all! Not for the faint hearted, but good exercise." 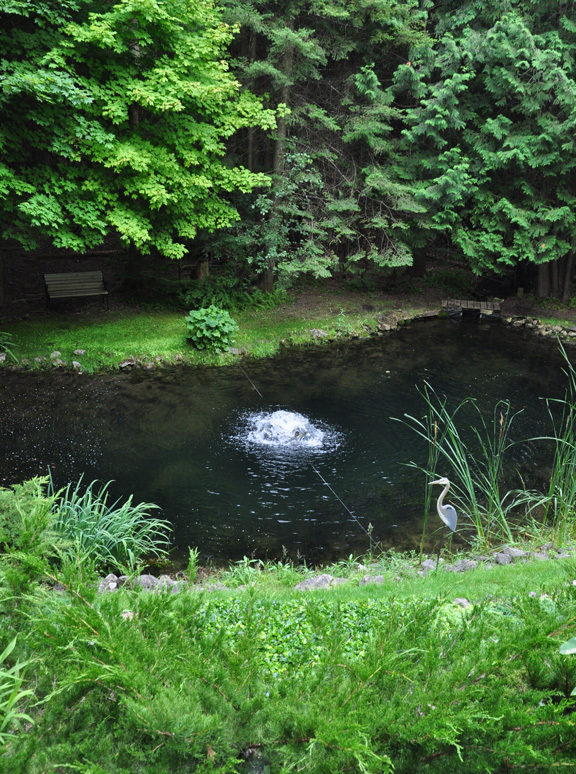 "The location was originally quite boggy and fed with a spring, so it was a natural area to visualize a pond. It was dug out with a backhoe, which got stuck in the mud more than once. The finished depth in the middle is now about 9ft." 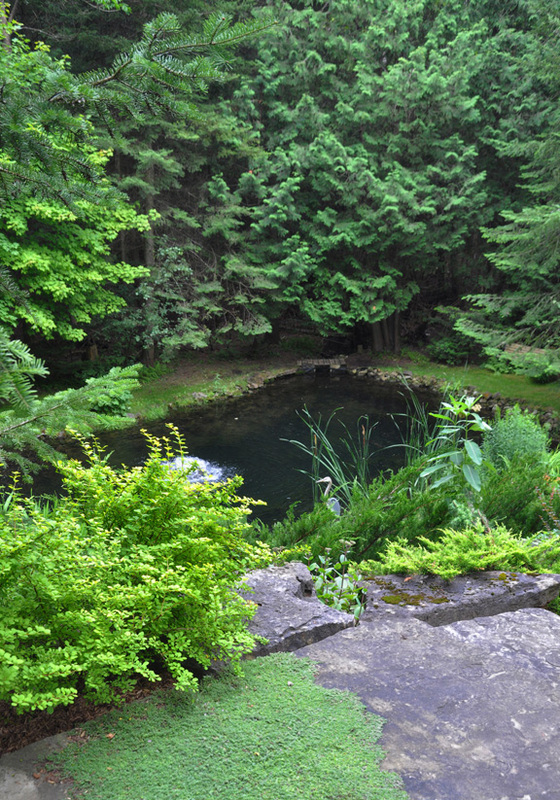 "The pond is lined (the spring keeps the level constant). Any overflow finds it’s way via a creek to the Eramosa River." "The pond is stocked with rainbow and speckled trout that overwinter there. The spring, which runs into the pond, keeps an open area in the ice which enables the water to stay well oxygenated," John tells me. "We had regular visits from great blue herons when the pond was newly stocked with small fish and now that they are full grown we see mink hunting in the area. When newly stocked several years ago we started with 50 fish, but nature takes it’s toll, and we now have about 15. Our oldest resident lived to be 9 years old." 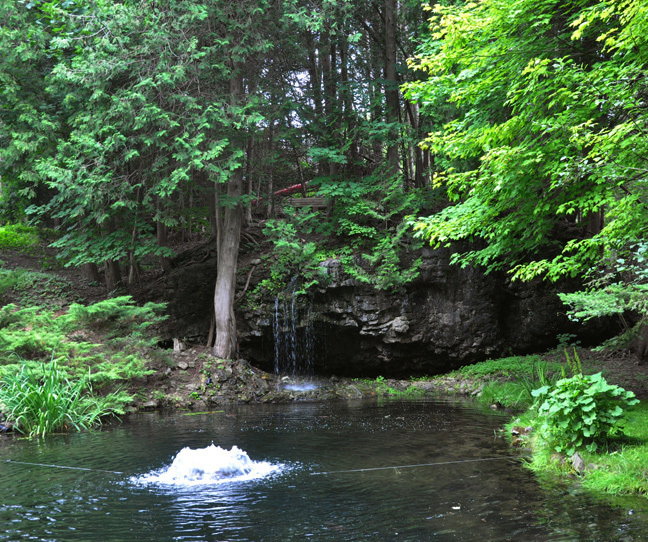 "The 12 ft. limestone rock face is naturally occurring, we have a pump underneath which cycles the water to the top, making a gentle and natural looking waterfall," says John. "Cedar bark was tied around the pipe carrying the water to the top of the rock face so that the workings of the waterfall are camouflaged for a more natural look." I asked Peggy about her favourite plants. "Favourite plants? 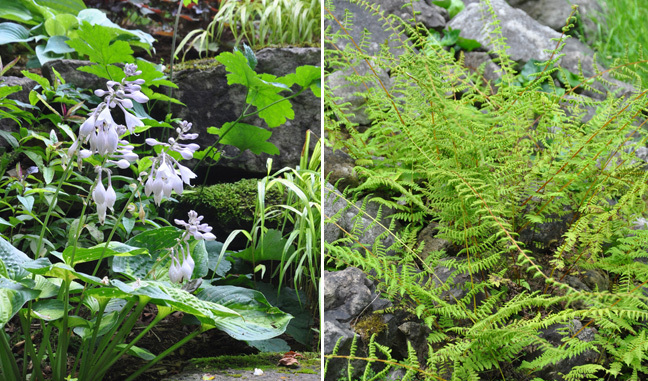 We all have lots of those!," she replies,"For shade, Maidenhair Ferns, which look so delicate and lacy, but are actually quite tough in our garden. Japanese Painted Ferns. which are tough and are quite happy to be divided and spread around the garden... I love ferns!" 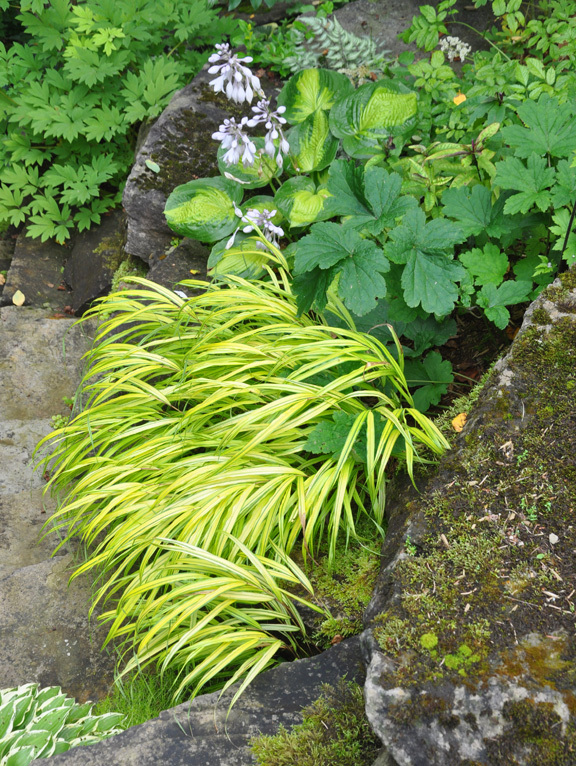 "Japanese Forest Grasses of all varieties which so elegantly drape over rocks and the edges of raised beds," Peggy continues her list. 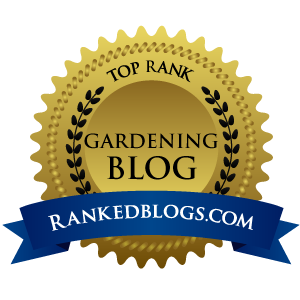 "We have a lot of hostas in the garden, another good shade plant...all sizes from the huge 'Sum and Substance' to the tiny 'Blue Mouse Ears'." "For spring colour in the shade garden, Bleeding Heart is a favourite, pink or white flowering, both green or chartreuse foliage." "Some favourite spring flowering, sun-loving shrubs are lilac. We have a common lilac that flowers spectacularly next to our driveway, but had to remove a French hybrid because it just didn’t do well. Also we have a White Star Magnolia that flowers beautifully without fail." 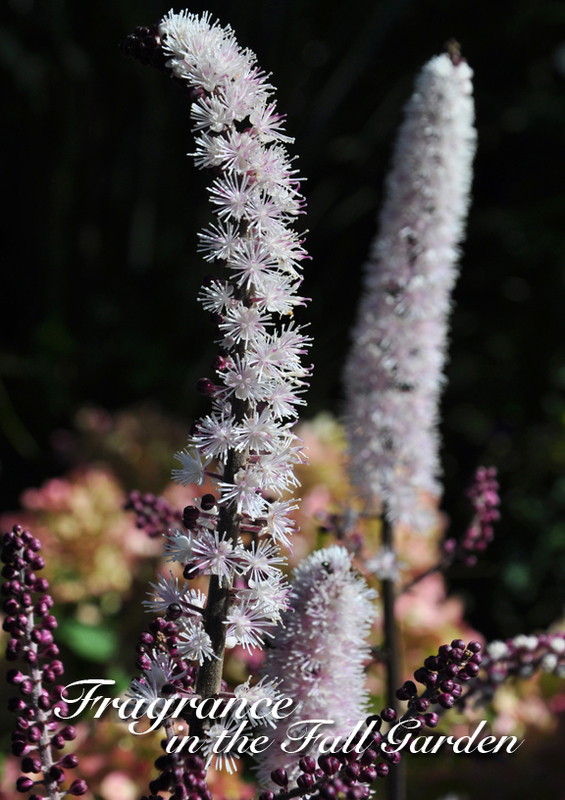 "Sometimes it isn’t just a favourite plant but rather a favourite combination of plants that pleases the eye. 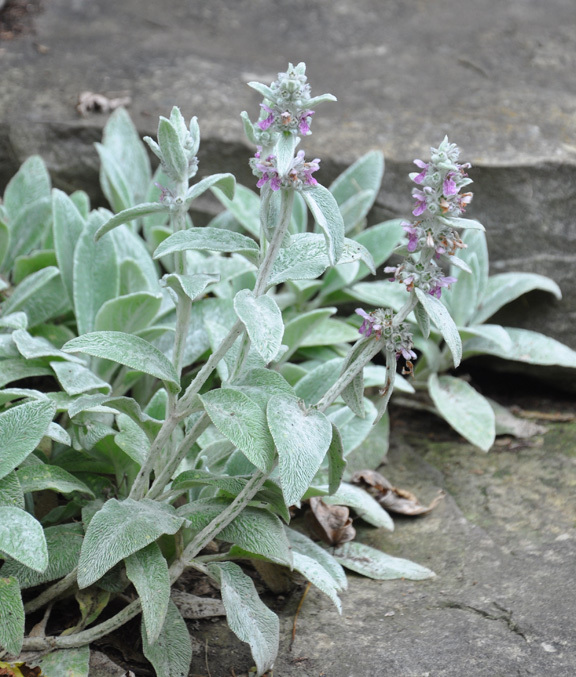 A favourite grouping is Ladies Mantle, chartreuse Forest Grass, the bright blue of trailing Waterfalls Campanula and the soft grey of Lambs Ears. I could go on and on," Peggy says. "The boardwalks enable direct access across some boggy garden areas to the acres of forested conservation area and a regional scout-camp with many trails, limestone cliffs and geological pot-holes. the Eramosa River runs through it all. We have made good use of the trails over the years for dog walking and exploring with our grandchildren. We are encouraging the spread of wild ferns in these damp areas, including Ostrich, Sensitive and Hay Scented ferns," Peggy tells me. Looking back up the slope, it is easy to think that you'd have to be part Mountain goat to garden here, but Peggy takes it all in stride. 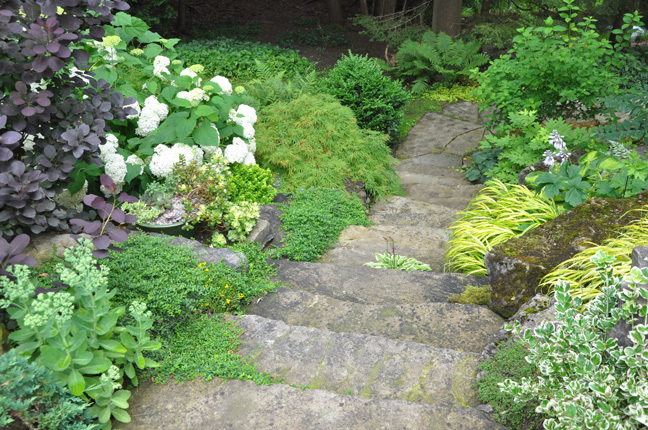 "The steep slope is a challenge to garden on, especially as we are not as nimble as we once were!,"she laughs. "Recently we have been getting some gardening help on the steeper areas.Our aim with our plantings was to cover the hill with low maintenance plants which we keep well mulched." "There was some existing English Ivy groundcover from the previous owners, difficult to eradicate but it gets a severe haircut every year to keep it from smothering out other plants. There are many evergreens planted, along with Buddleia and Sedum 'Autumn Joy' for autumn colour." "The slope is south facing so can become dry; in periods of prolonged drought we have an old pump that takes water from the pond for occasional watering." The property may have its challenges, but it is hard to imagine a more spectacular setting for a garden! The older I get, the more artificial fragrances bother me. I dread a walk down the laundry soap isle in the grocery store. The highly perfumed detergents and fabric softeners overwhelm me and put me on edge. I can't wait to flee. The underlying problem is that "fragrance" is a great catchall for many unnamed and somewhat dubious chemical ingredients. No wonder they can be unpleasant! The natural fragrances I find in the garden do not have the same effect on me at all. I still love it when my fingers end up smelling like roses after I do my deadheading. I don't even mind the white Actea that blooms in the fall and fills the air with the most intense perfume. Am I alone in this? I'd love to hear about your experiences with fragrance in the comment section. 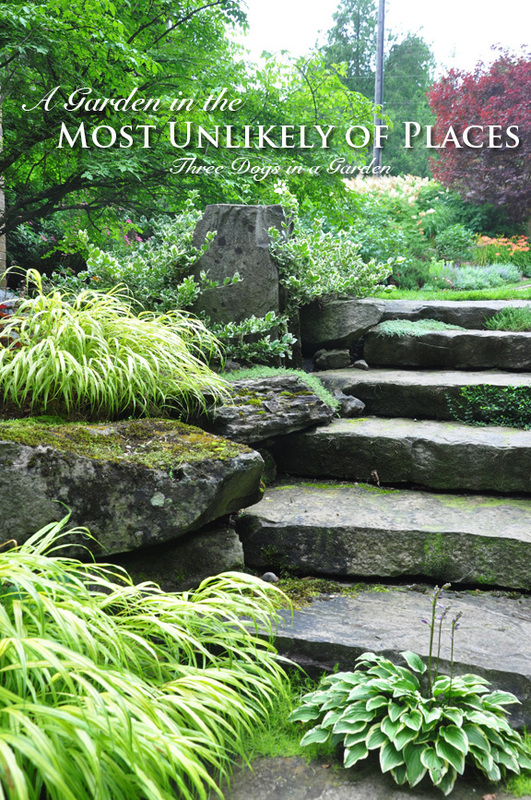 • Place fragrant flowers in an area you pass frequently. 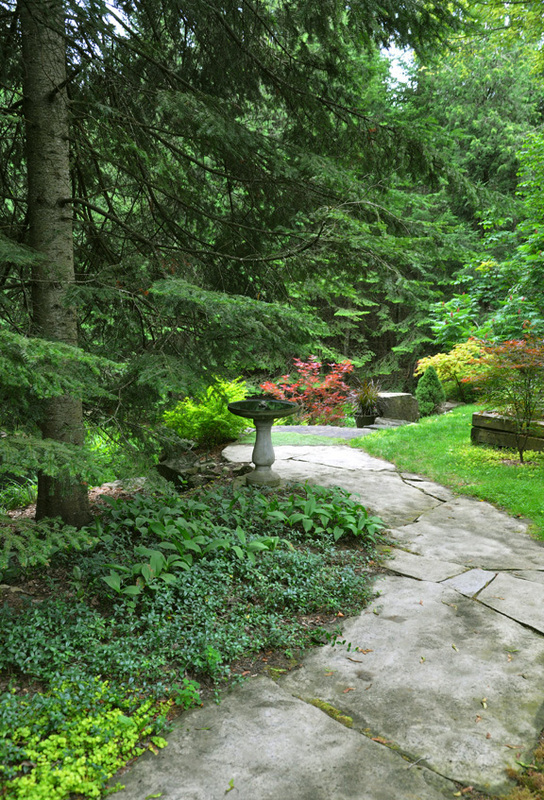 • Edge a pathway so visitors will brush by fragrant plants. 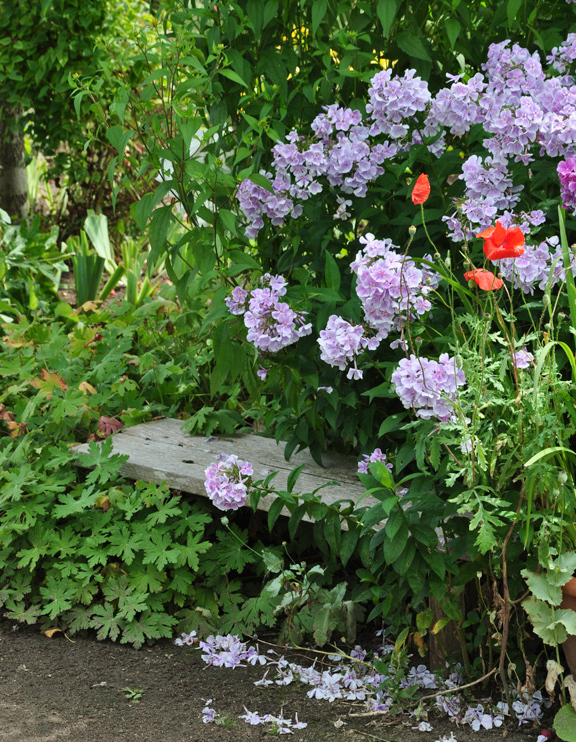 • Plant fragrant flowers next to a bench or seating area. 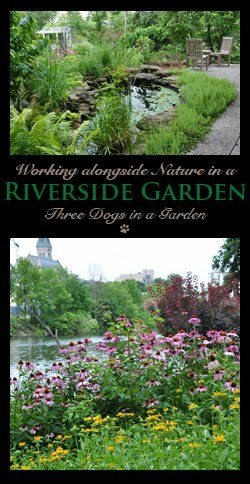 • Many flowers are their most fragrant at night, so plant them near a deck or patio so you can enjoy them on warm summer nights. • Shop for variety as well as type of flower. Daylilies are not usually very fragrant, but my Mom had an old yellow variety that had an amazingly scent. Roses are another great example. Most modern roses have little or no smell. 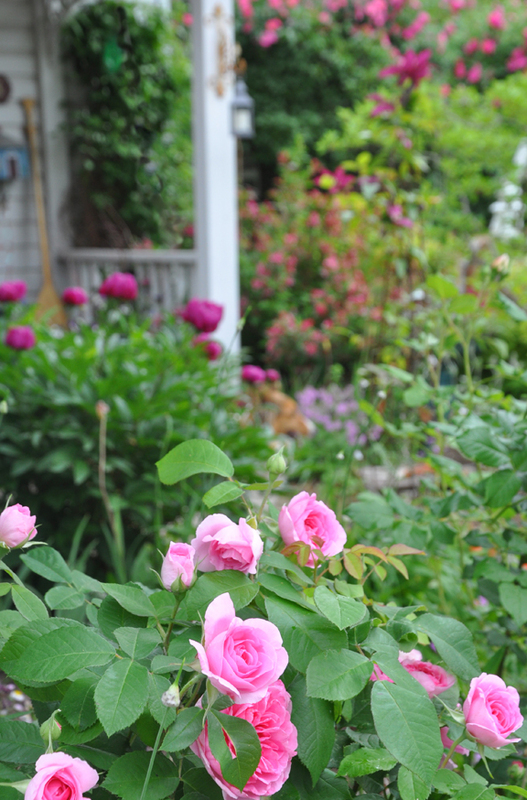 Check the plant tag or descriptives in nursery listings to make sure you are choosing a rose that smells divine! • Don't forget about aromatic foliage. For example, I love the fresh scent of Ostrich Ferns. 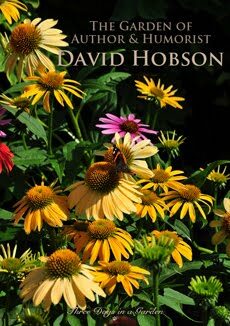 • Herbs have aromatic foliage and sometimes have scented blooms. Lavender is a perfect example. 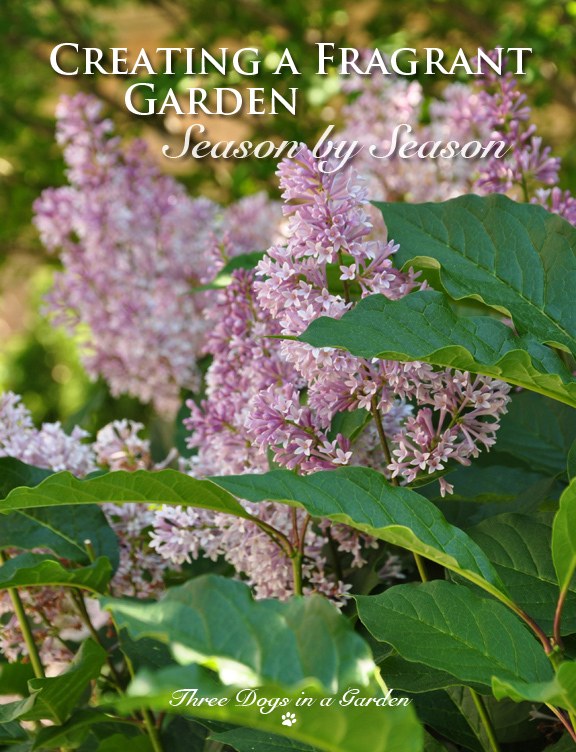 • Plan beyond spring and try to have at least a few plants in each season that will be fragrant. Woodland Phlox in my own garden. 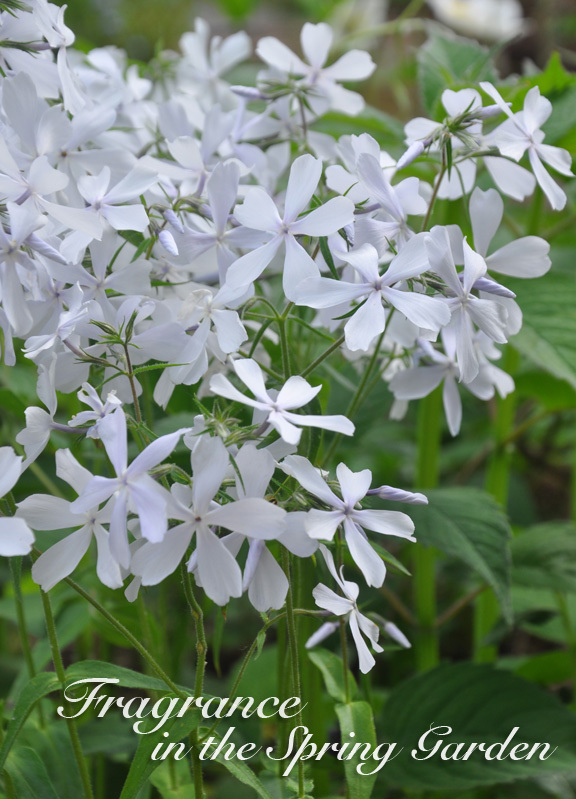 Woodland Phlox, Phlox divaricata 'May Breeze' has fragrant, star-shaped white flowers in early spring. 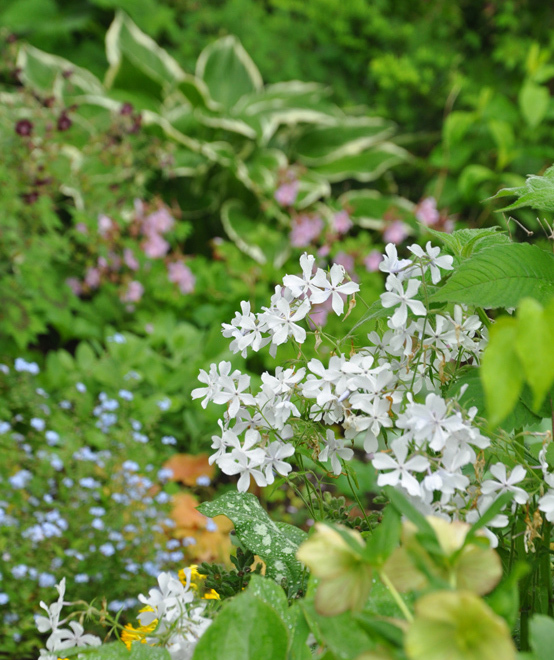 Unlike more familiar Phlox paniculata that blooms much later in the summer, this plant has fine, delicate foliage. Phlox divaricata 'May Breeze' slowly spreads to form a small clump. Divide in the fall. Moist soil and part to full shade are this plants preferences. Height: 30-40 cm (12-16 inches), Spread: 30-60 cm ( 12-23 inches). USDA zones: 3-9. The path leading toward my four raised beds. Dwarf Korean Lilac tree form, Syringa meyeri 'Palibin' in the near distance. A young Fringe Tree at Earthbound Gardens on the Bruce Peninsula. 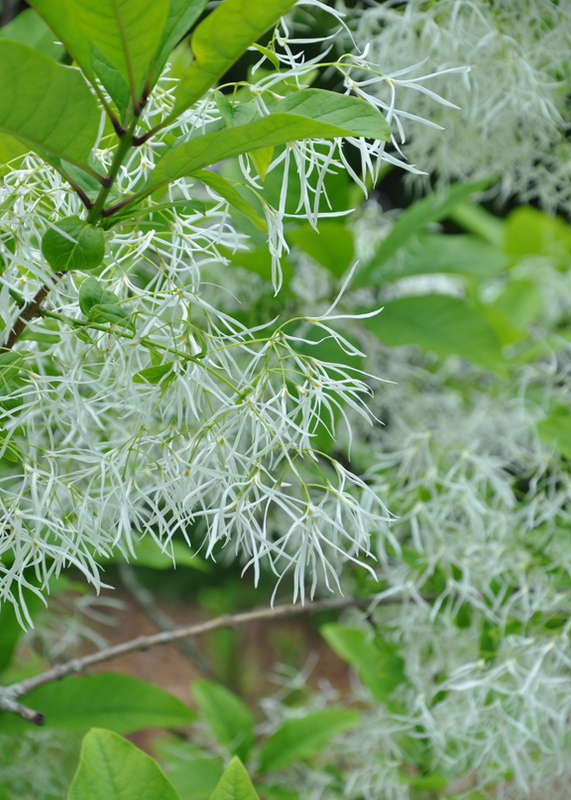 White Fringe Tree, Chionanthus virginicus has showy white flowers that are fragrant. This deciduous tree is easily grown in average, well-drained soil and will reach a height of 20-25 feet. It requires full sun. USDA zones: 3-9. Peonies at Keppel Croft Garden on the Bruce Peninsula. Peonies from my own garden. 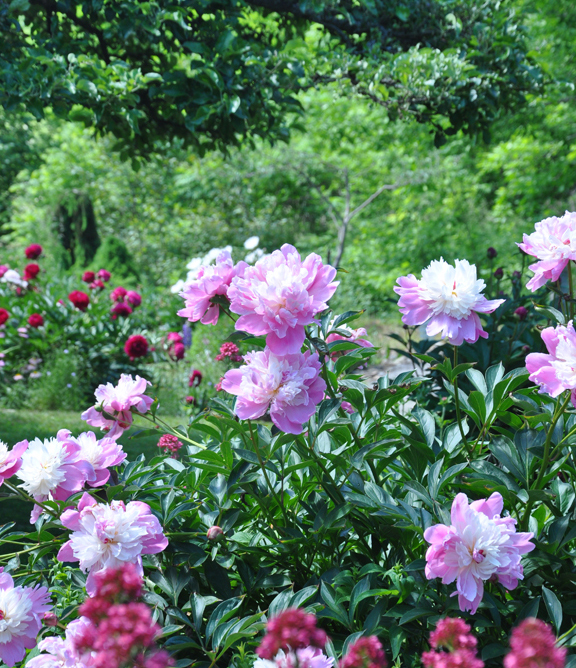 Not all peonies are fragrant, but many cultivars have a pleasant scent. 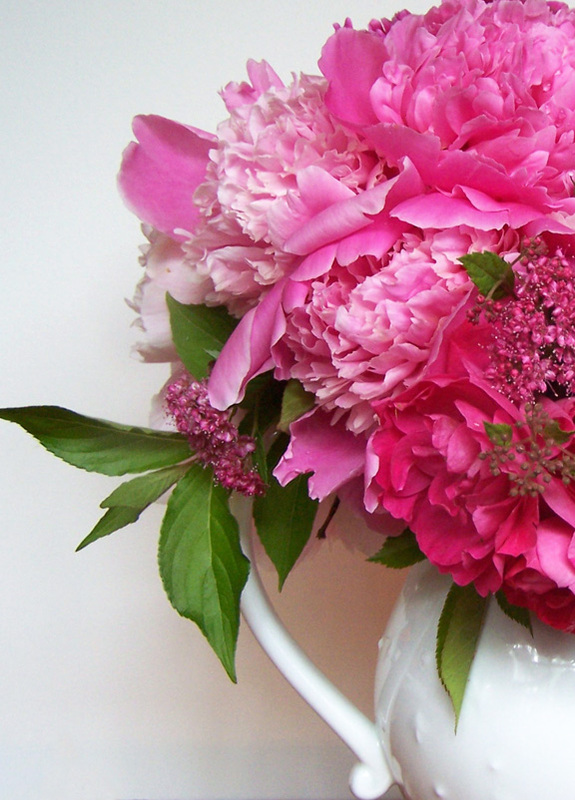 Read more about growing peonies here. More peonies at Keppel Croft Garden. Read more about this garden filled with lavender and heather here. It's summertime and the days are hot and languid. It's the perfect time to sit with a cold drink and enjoy some of the garden's most striking scents. 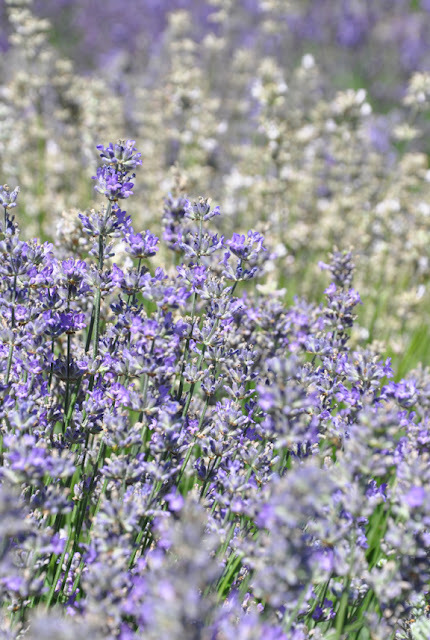 Lavender likes poor soil with good drainage. Read more about growing Lavender here. Make a lavender sachet here. 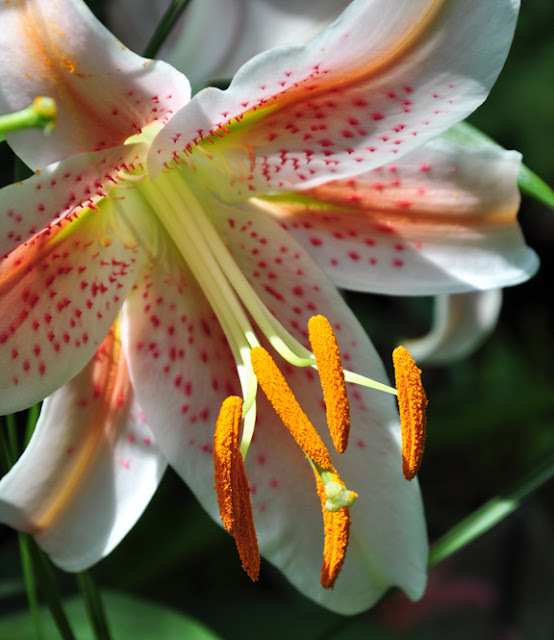 For mid-summer fragrance it is hard to beat Oriental Lilies. Plant Oriental Lily bulbs in the spring or fall in full sun. 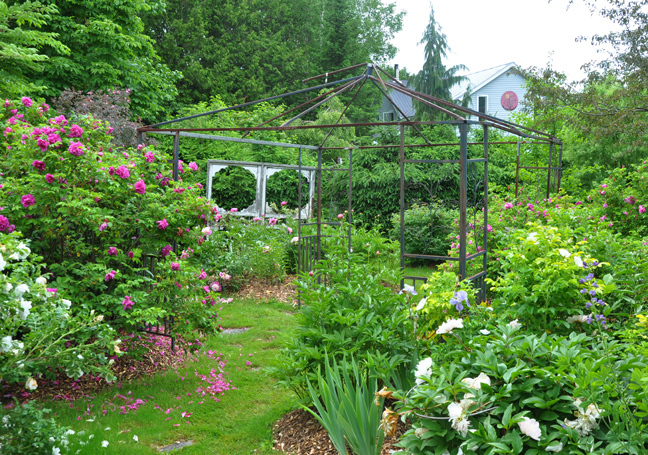 Old shrub roses at Earthbound Gardens on the Bruce Peninsula. 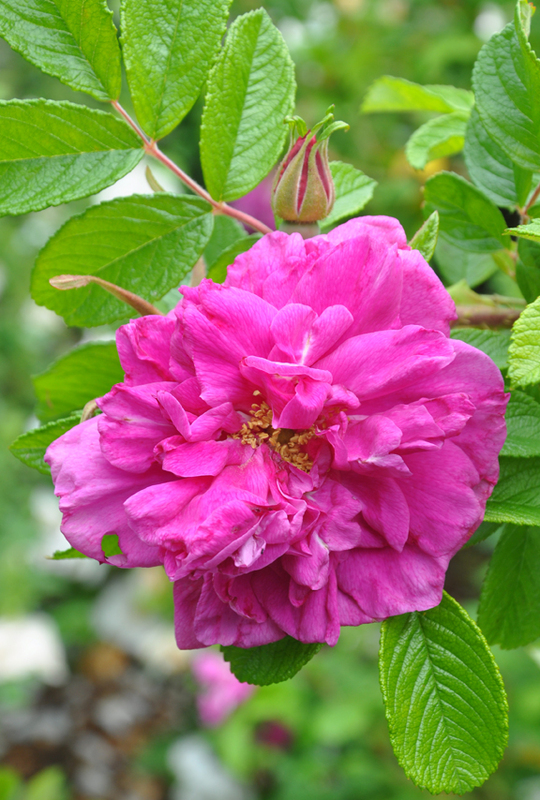 Old fashioned shrub rose at Earthbound Gardens. 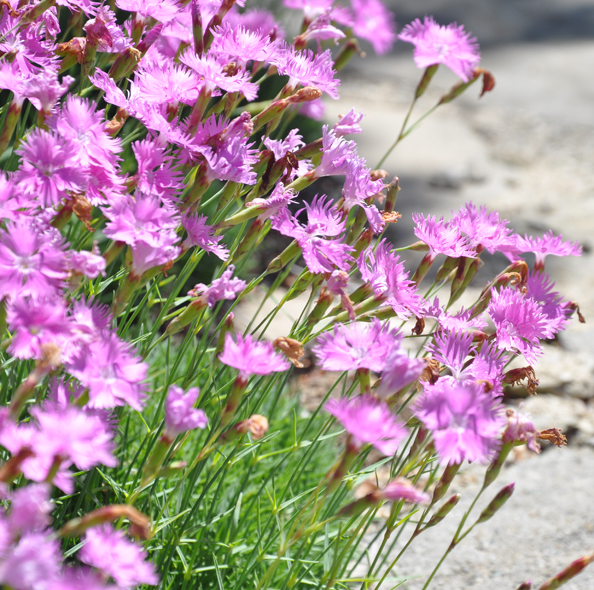 Pinks, Dianthus have a rich, spicy fragrance. Plant them in full sun. (or Cimicifuga as it was formerly known) here. It's fall. The days are shorter, but there is some welcome relief from the heat. 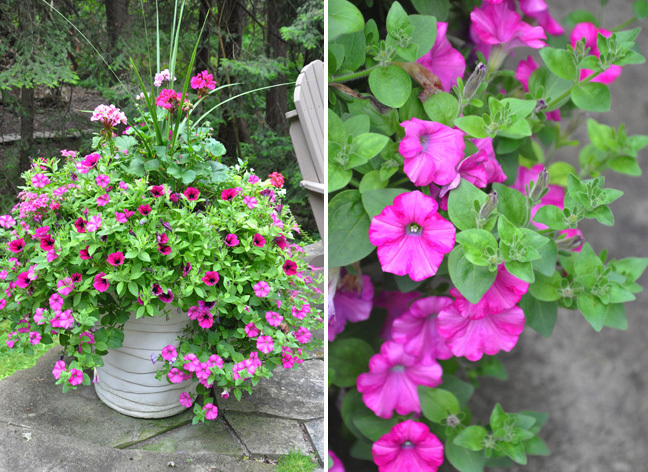 Summer annuals are often at their fragrant best at this time of year. There are also a few perennials making their own contribution. Phlox paniculata 'Franz Shubert' at Larkwhistle Garden on the Bruce Peninsula. Phlox paniculata 'Blue Paradise' in Joe's Brampton garden. There is lots of talk about limiting perfume in the workplace and other public spaces. What are your feelings about fragrance in general? 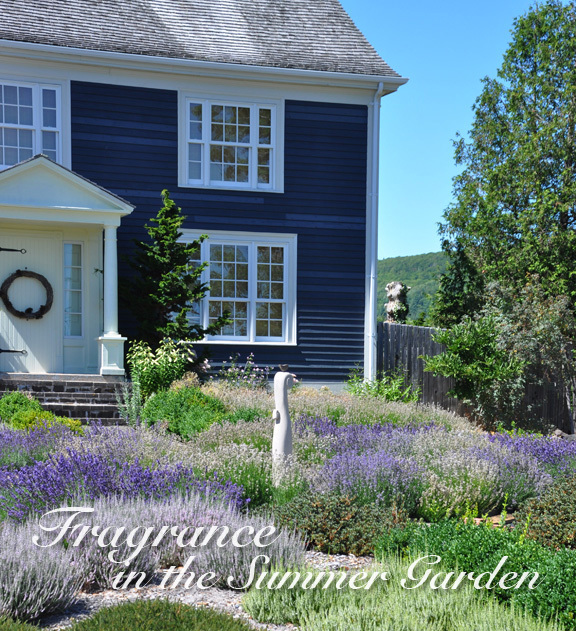 And how do you feel about fragrance in the garden? I am curious to know! and soil that is evenly moist. I have a soft spot for ferns. I like seeing their bright, kelly-green foliage on my window ledge in the winter months when the garden is blanketed by snow. Ferns do well for me. They seem to like the morning sunshine that my biggest windowsill affords. 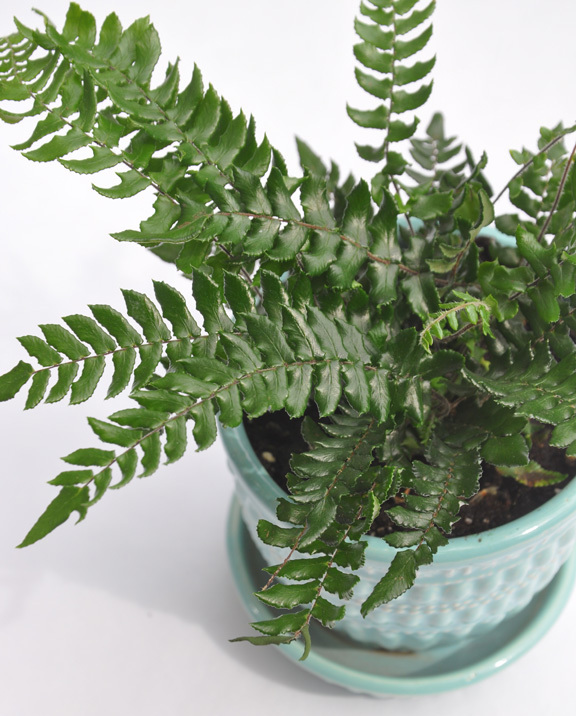 I often move my ferns outdoors in the summer and back inside in the fall. 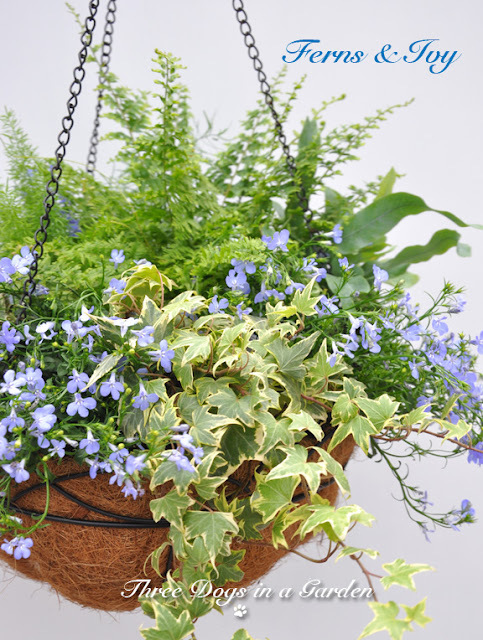 All of the ferns in this hanging basket (above) performed well in a shady outdoor spot. The only thing they demanded was regular watering. In the fall, I divided the container planting and potted up the ferns individually for the winter months. 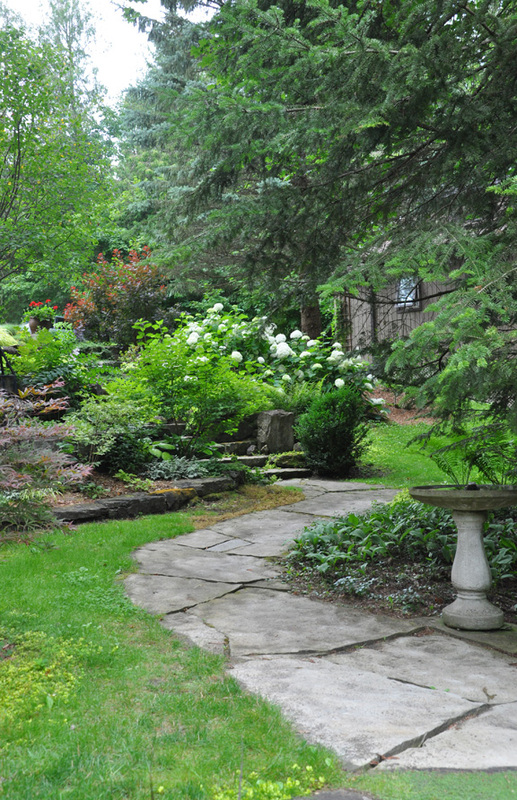 Birdbath container planting in a private garden in Toronto. As well as ferns, this post touches briefly on plants that look like ferns, and are commonly referred to as ferns, but aren't actually ferns at all. 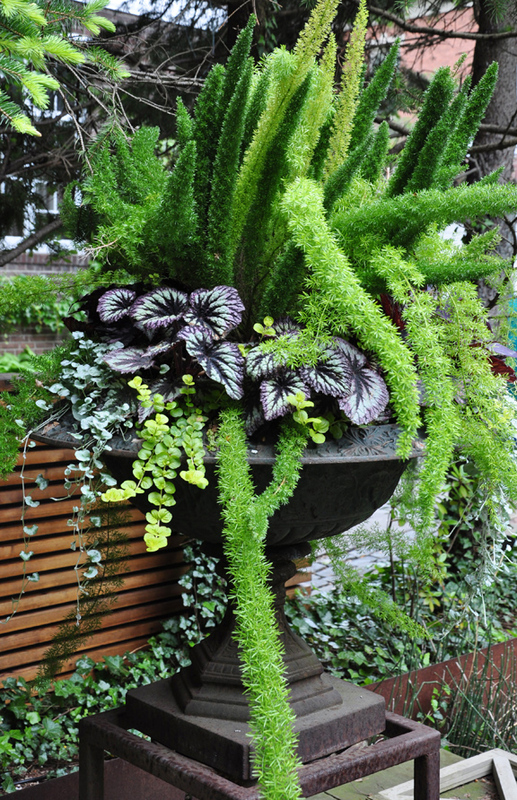 These fern-like plants make nice outdoor container plants too. 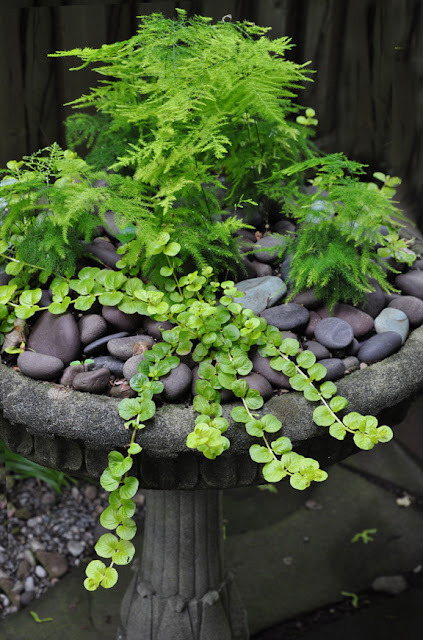 This birdbath is my favourite example of using one of these non-hardy fern look-a-likes in a outdoor container planting. florists as a filler in arrangements. It's not a true fern but is actually a member of the lily family. 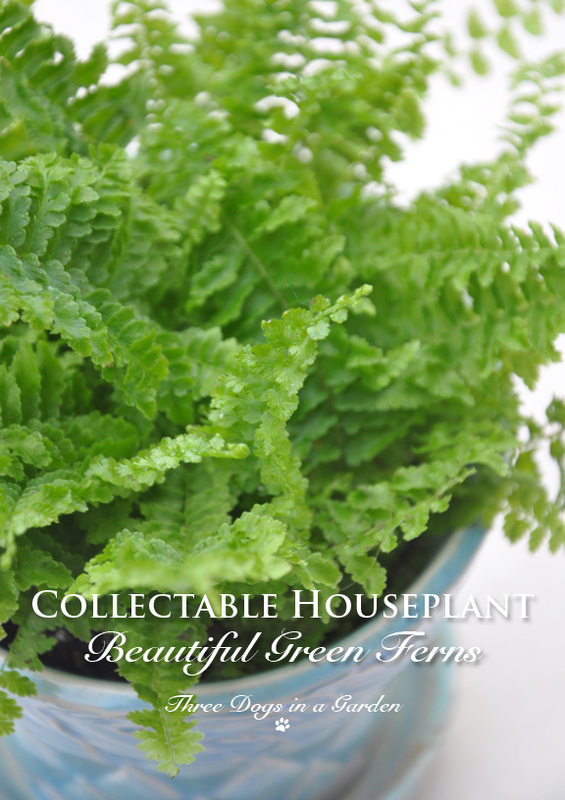 There are quite an array of indoor ferns you can collect and most of them like similar growing conditions. Light: Avoid direct sunlight. Ferns like bright, diffused light. They prefer a north-facing windowsill that has indirect light. An east facing window is also good throughout most of the year, but may become too bright in the spring and summer months. 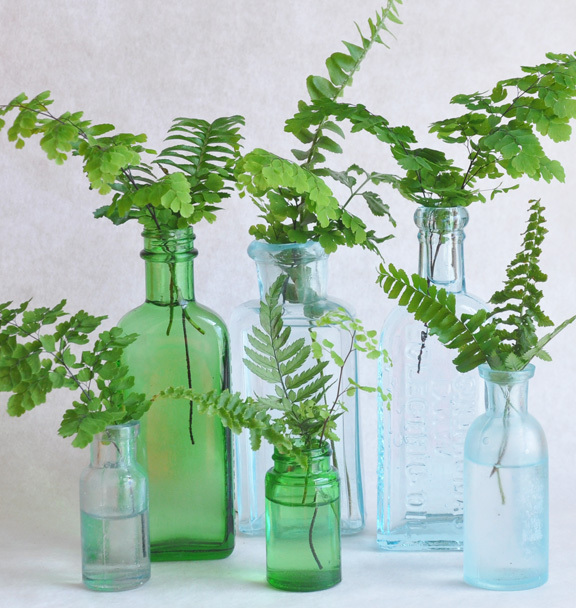 With a east-facing situation, it a good idea to move your ferns back a few feet from the window in the summer or install a sheer curtain to help block the hot afternoon rays. Water: Ferns like evenly moist soil and regular waterings. Water deeply! I always take my ferns to the sink and give them a really good soak. Most indoor ferns are tropical, so lukewarm water is best. Soil: Ferns like a good quality, well-drained potting soil. Temperature: A fern's native habitat will tell you all you need to know about the temperatures it prefers. Ferns from the tropics like temperatures in the 60-70 degree F range (15-21 degrees C) Those from more temperate areas of the world are much more adaptable to a cool spot next to a window. Humidity: Providing a fern with the humidity it likes can be a challenge. If your house is really dry, you can mist them with lukewarm distilled water. You can also place the fern in a closed terrarium, put it under a cloche or stand it in a water-filled tray of pebbles. A few ferns that don't mind low humidity include: Boston Fern, Nephrolepis, Button Fern, Pellaea, Rabbit's Foot Fern, Davallia and Staghorn Fern, Platycerium. 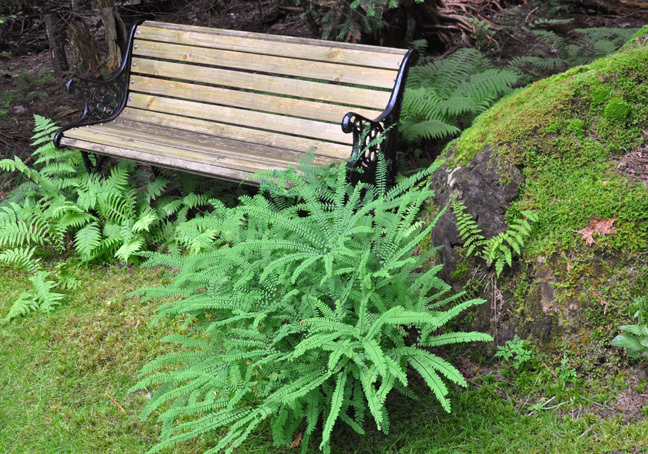 Ongoing Care: Keep your ferns looking their best by trimming away any brown or damaged fronds. Repot a potbound fern in the spring. 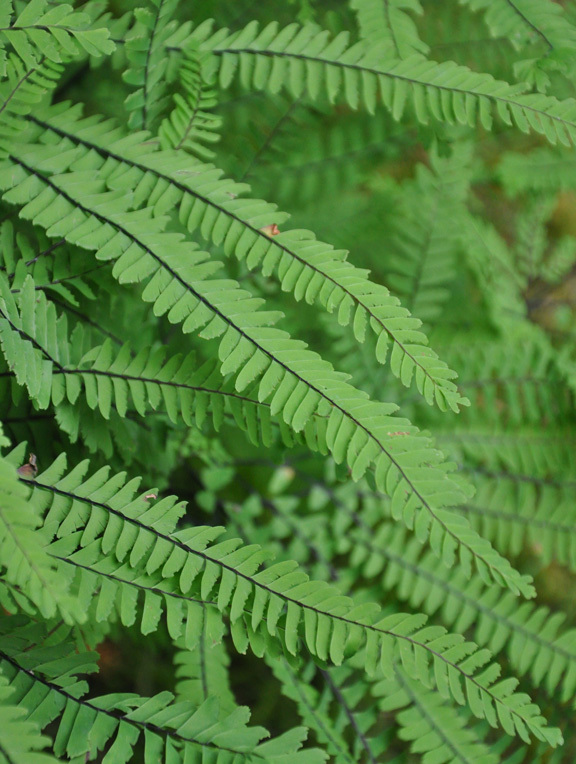 Fertilizer: In the wild, most ferns live on the forest floor where there is shade and plenty of decaying organic matter. In the spring and summer use a liquid fertilizer (following the label's directions) every couple of weeks. Using a fertilizer in the winter months, when the plant is not actively growing, is unnecessary. 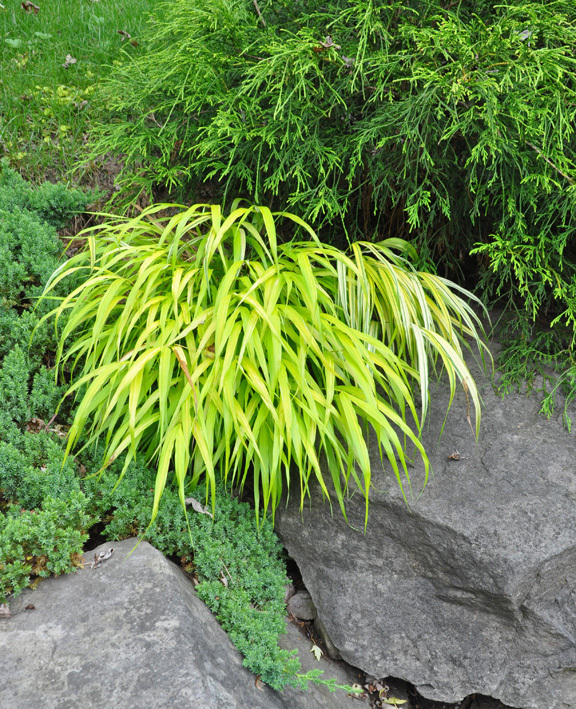 Excessive fertilization in the winter can actually cause brown, wilted fronds. 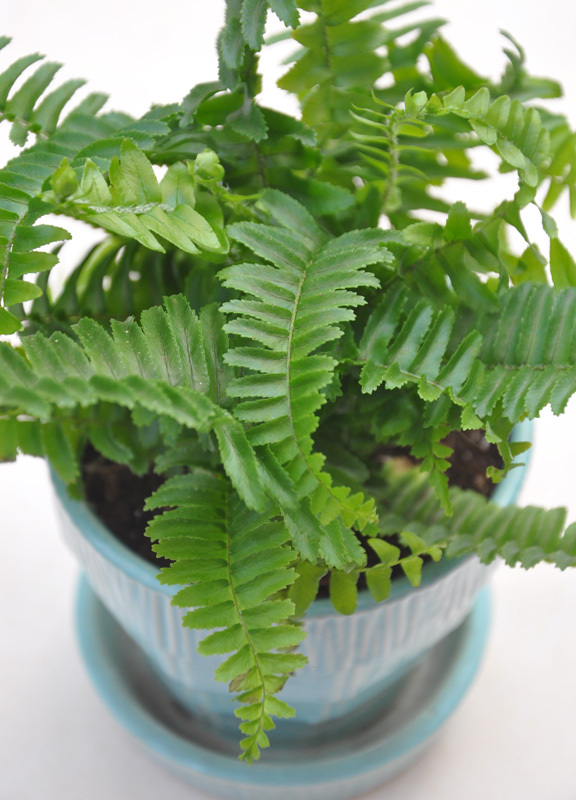 Propagation: A large fern can be repotted or you can use the opportunity to divide it. Remove the pot and carefully break the plant into smaller pieces. Replant the divisions and water well. Pests and Diseases: Possible insect pests include mealy bugs (soft, downy looking insects), spider mites (look for delicate webbing) and scale insects that can form lumpy colonies. Sword Fern or Jester's Crown Fern, Nephrolepis obliterata makes quite a bushy plant and has sword-shaped fronds. In the wild, it can be found growing in the rainforests of Australia and New Guinea. 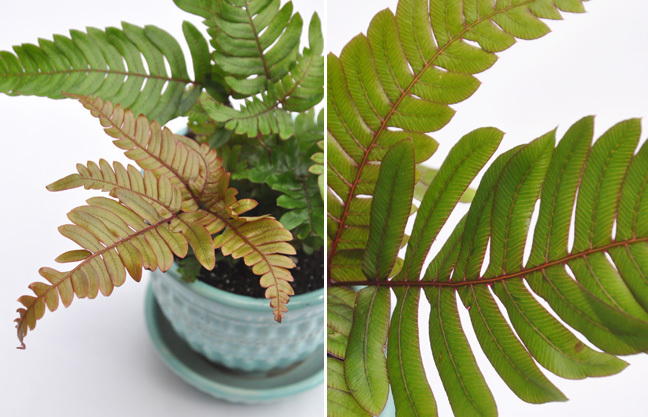 Tricolor Fern, Pteris aspericaulis 'Tricolor' is another tropical fern that has pretty red stems and new growth that is bronze in color. Silver Lace Fern, Pteris ensiformis (sometimes called Sword or Slender Brake Fern) has delicate, dark green leaves with silvery accents. Glowstar Fern, Pellaea 'Glowstar' has shiny, dark green fronds. It originates in eastern Australia. Korean Rock Fern, Polystichum tsus-simense (family dryopteridaceae) has lance-shaped fronds. It is a South Asian fern that grows in shade near water or on rocky faces. This fern can take a fair bit of shade. 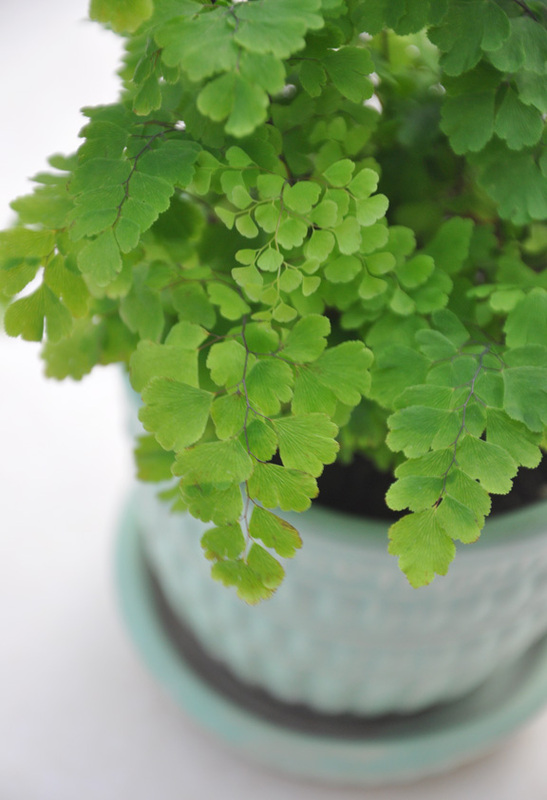 Maidenhair Fern, Adiantum raddianum likes bright diffused light and evenly moist soil. 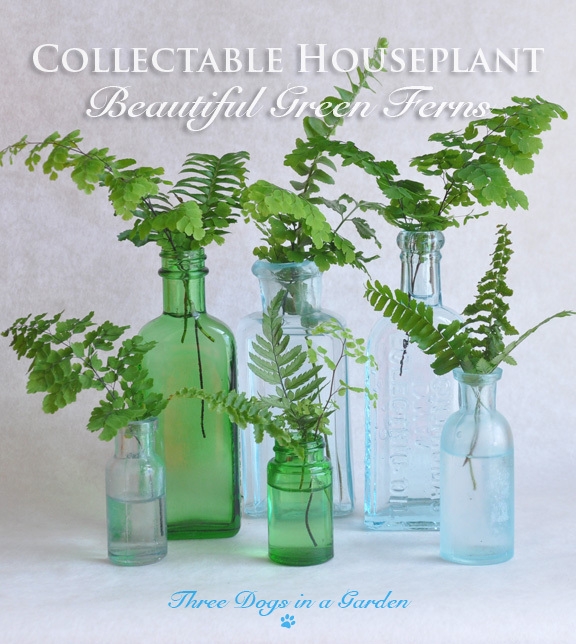 Maidenhair Ferns, Adiantum Raddianum have to be one of the prettiest indoor ferns, but they have a reputation for being difficult, so I thought I would add a few extra pointers. Like most ferns, they like bright, but indirect light. Too much sun and their foliage will scorch. Too little light and they turn yellow. The soil in their pots needs to be kept evenly moist, but not soggy. Neglect to water them and they shrivel in a heart beat. If this happens, cut the fronds off at ground level, water well, and fingers crossed, your Maidenhair Fern will recover. This is a plant from the Brazilian tropics, so it prefers a consistently warm spot. 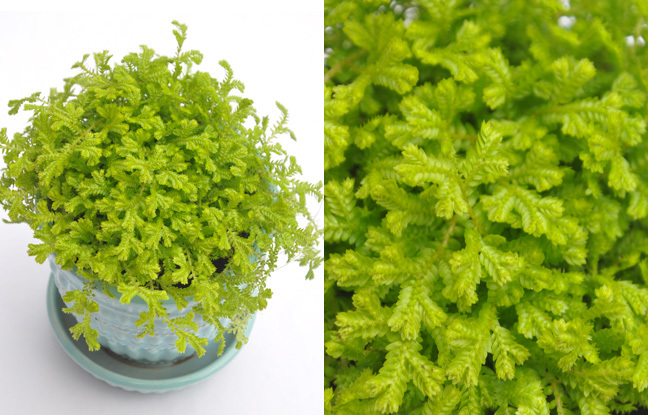 It's also a fern that craves humidity (see care tips above). 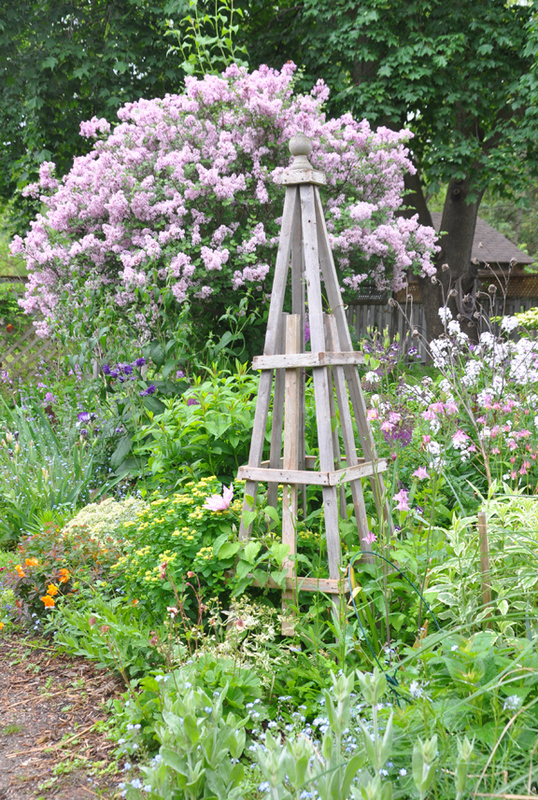 Asparagus densiflorus in a private Toronto garden. 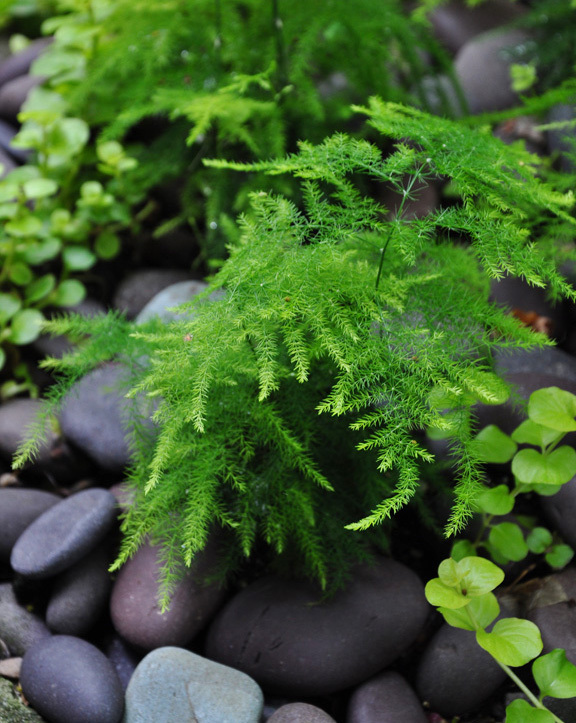 The Asparagus "Fern", Asparagus retrofractus with its fine, feathery foliage that makes it look like a fern, but it is actually a member of the Liliaceae family. This houseplant has some definite drawbacks. The fine, needle-like foliage is feathery soft, but the base of the plant's woody stems have fine thorns. Ouch! Asparagus retrofractus also has a way of dropping their fine leaves the moment they get a bit dry. The good news is this plant is very easy to grow provided you water it regularly and give it a spot in a north-facing window. The Foxtail "Fern", Asparagus densiflorus is very similar to Asparagus retrofractus, but it has foxtail-shaped plumes. The care for both plants is basically the same. It you want to take either plant outside for the summer, place them in a lightly shaded place with protection from the afternoon sun. Water them thoroughly and regularly. Moss Fern, Selaginella kraussiana 'Aurea' looks like a cross between a moss and a fern, but it is neither. It makes a great understory for taller houseplants or can be potted up all on its own. 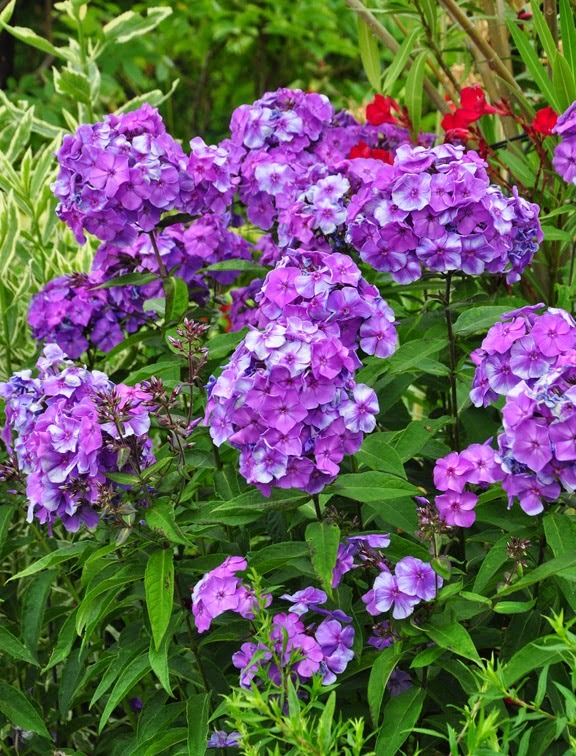 It likes humidity and moist conditions, so don't let the soil dry out completely. 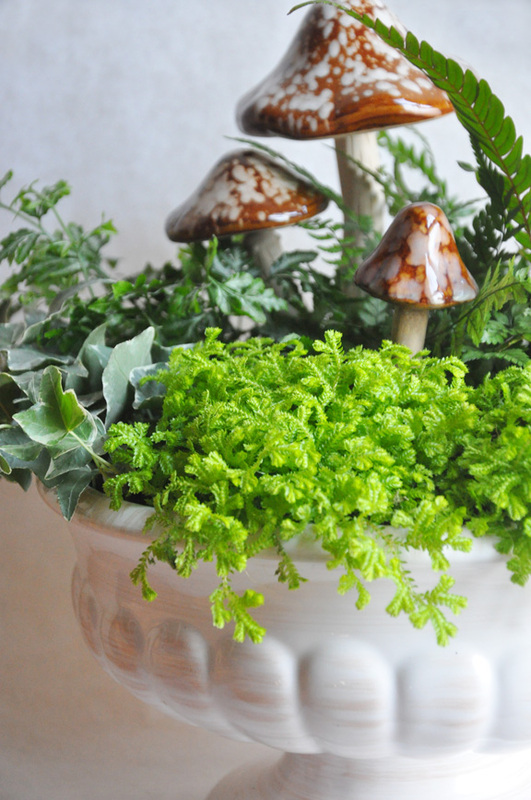 Like ferns, Selaginella is easily scorched by the sun, so give it indirect light. 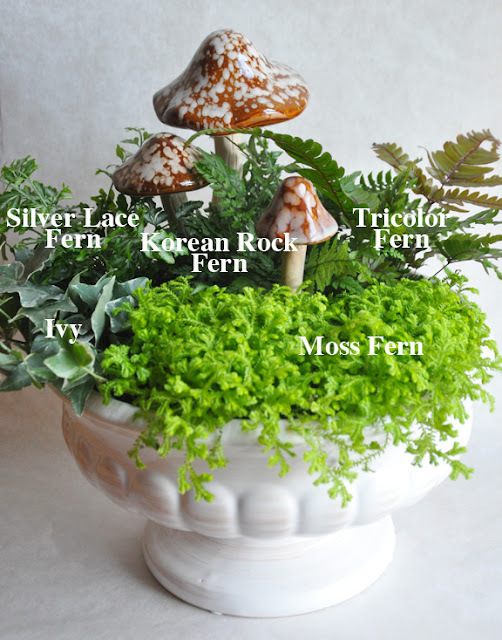 I thought that it might be fun to gather a few ferns along with some other houseplants into a container planting. Any ceramic container can be turned into a plant pot with a drainage hole. All you need is a drill and a set of tile and glass drill bits (these drill bits can be found at just about any hardware store). Drilling a drainage hole is fairly easy. There is just one tip: use a small puddle of water on the surface your ceramic dish to keep the container and the drill bit cool. I used three small ferns along with a Moss Fern, Selaginella and a variegated ivy. The mushrooms are from the Dollar Store (I think the large mushrooms were $2.50 and the little one was just $1). 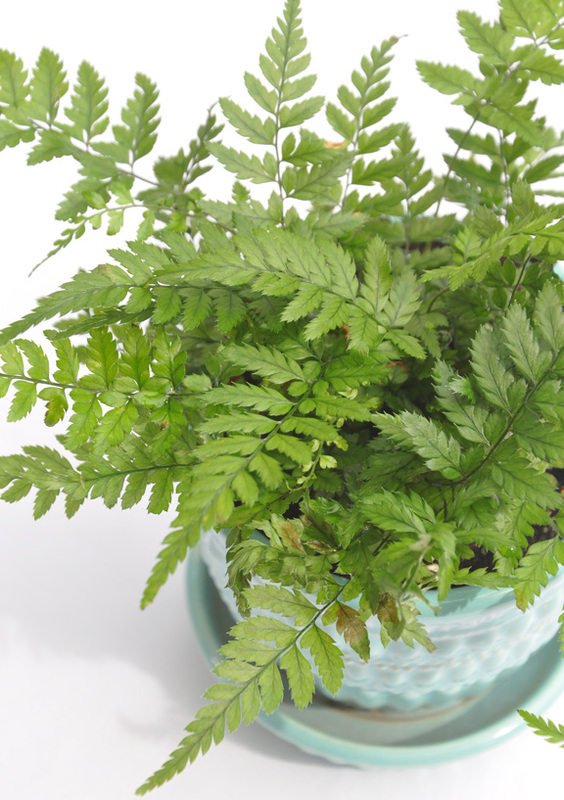 If you're an indoor gardener who sometimes forgets to water, ferns may not be for you. 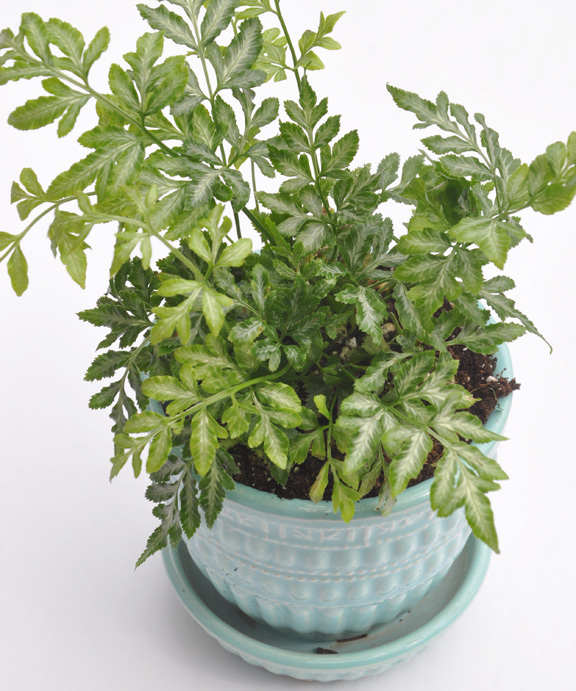 But if your willing to keep a watchful eye of your plants and have a room with indirect light, ferns might make a nice addition to your collection of houseplants.